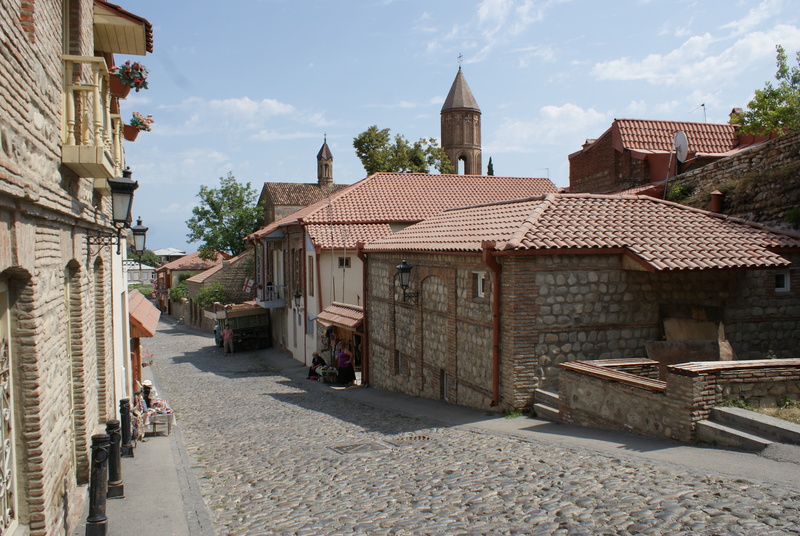 Sighnaghi - picture perfect but where are the people? Sighnaghi looked perfect. It certainly looks nothing like any other town we had been through. Immaculate, perfect roads and buildings, like a picture postcard. We quickly learned the truth – Sighnaghi has been totally rebuilt in recent years – everything is brand new – and it all looks like a medieval village. To us it felt false – as if someone had photoshopped their European ideal onto a Georgian town. So it looks magnificent in photos, but on the ground it’s lacking in character. Apart from some hotels and guesthouses there wasn’t anything to do – a few grocery stores, some banks and that was it. Yet out time in Sighnaghi was special. We were staying at a guesthouse that we had read about on the internet. We found our way to a huge house on about three levels and were shown to the basement. It was very off-putting and we prepared to leave but the owners explained that in the heat the basement was the best place to sleep. Still we resisted, and rather reluctantly they put us into a couple of much nicer bedrooms on the top floor. 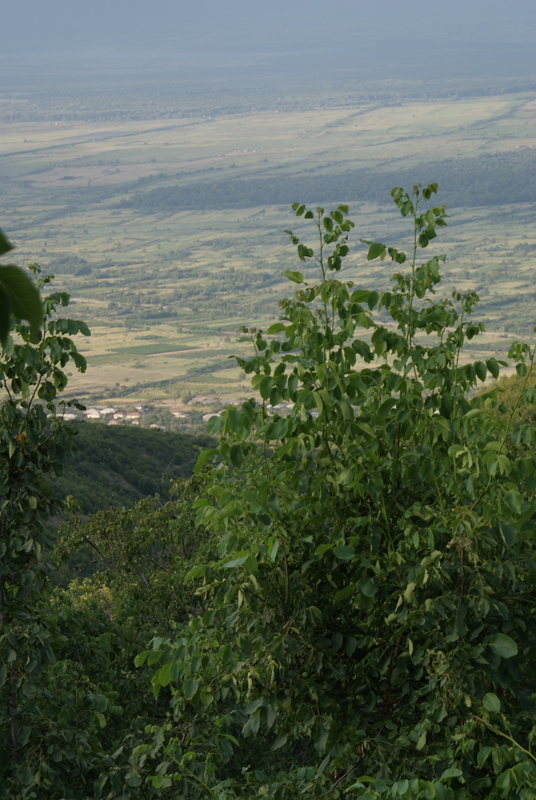 The house had a magnificent view and a huge back yard of vines and other fruit trees. Soon the place was buzzing with other travelers. We met a few young Israeli couples in the middle of a backpacking trip through the country, as well as a lovely Basque couple, Iosu and Sion, who liked Daniel so much that they gave him a genuine real Sociedad soccer shirt. Daniel was thrilled, especially following the fiasco of the fake Spanish soccer shirt we bought at the market in Tbiliisi – fake is fine if it looks real, but the spelling was incorrect on his shirt which really upset him. 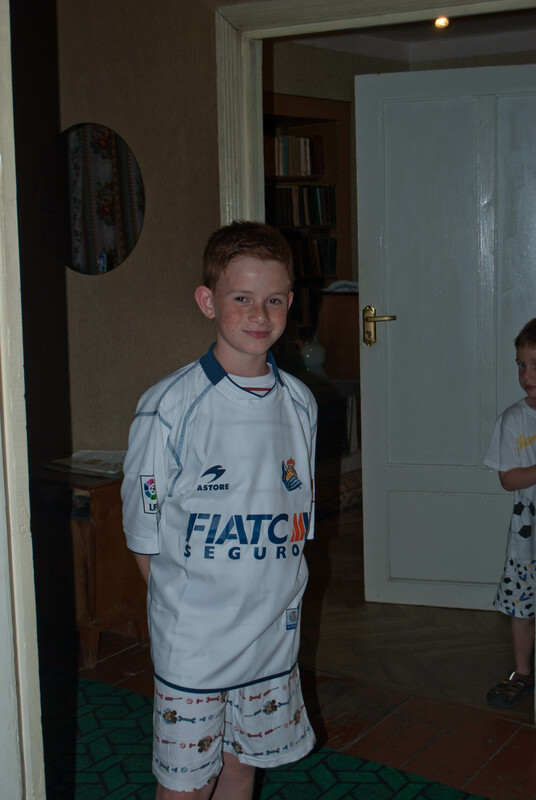 The one condition that Daniel was given was that he shouldn’t wear the shirt with his Spain soccer pants – feelings clearly still run deep in Basque Country about keeping their own identity seperate from Spain. (Actually,Sociedad is the soccer team from San Sebastian – one of our favourite places in Europe). Our fellow travelers were fabulous – they took to the kids and for the first time in Georgia we really had a great opportunity to mingle with other people. Up to now we had been staying either in an apartment, or in guesthouses where we were the only guests, but this place reminded us of our travels in South East Asia, where we had always met other travelers. The family turned out to be very friendly and also spoke some basic English. And then came the food – when Eitan mentioned he was hungry at about 5pm, the guesthouse mother and grandmother whipped up a huge snack of bread, vegetables and spreads and within a few minutes we were eating. And this wasn’t dinner, which when it arrived a few hours later literally covered the table from end to end – salads, breads, eggplant with walnuts, meat (no pork – since most of the guests that night wouldn’t eat it). Wine and chacha were plentiful as well. Malchas our driver was staying there too, and he took it upon himself to turn the meal into a real Georgian feast by taking on the role of Toastmaster or “Tamada”. He began a seemingly endless series of toasts – now, this is very serious business in Georgia and one is expected to participate in the event by drinking copious quantities of wine. Toasting the country, women, children, friends, us and especially Eitan, our 5-year-old, who Malchas had become very attached to (he didn’t have kids of his own). Daniel- wearing his new shirt! The evening was great fun. Eventually it was time for the kids to go to sleep and we took our leave. Only later did we realise how correct the guesthouse owners had been – our rooms up top were stifling hot and we could hardly sleep, while the others below were a whole lot cooler. Sometimes, less is more!